Worn cabinets can ruin an otherwise beautiful aesthetic—but a fresh coat of paint will hide a multitude of sins. Cabinets take up a considerable amount of space in just about any kitchen, so they can make or break a room. If your cabinets are looking a little tired, it might be time for a makeover. For many years, natural wood stains and whitewashes were the most popular cabinet finishes. And while woodgrains still hold appeal in some markets, painted cabinets are now universally hot. You see painted cabinets everywhere and with good reason: They provide a clean, sleek look that works well with every decorating style, from Midcentury Modern to industrial chic to cottage, and they’re easy to keep clean, especially with technological advancements in today’s paints. The most popular cabinet colors in recent years have been white and off-white, but more colorful options are also emerging. It’s becoming common for a homeowner to apply a hue from the home’s larger color scheme to the cabinetry. Grays, slate blues, sage greens, and even muted purples—all popular decorating colors—are becoming common. Because kitchens are often visible from other areas of the house, the trend helps tie rooms together, too. Once you’ve made the decision to paint your cabinets, how do you proceed? The easiest answer: Call a professional painter. If you choose to do the work yourself, however, follow these directions. Empty cabinets. Remove fronts and hardware. Clean all parts of the cabinets to remove grease, dust, food residue, and other dirt. Caulk holes and gauges. 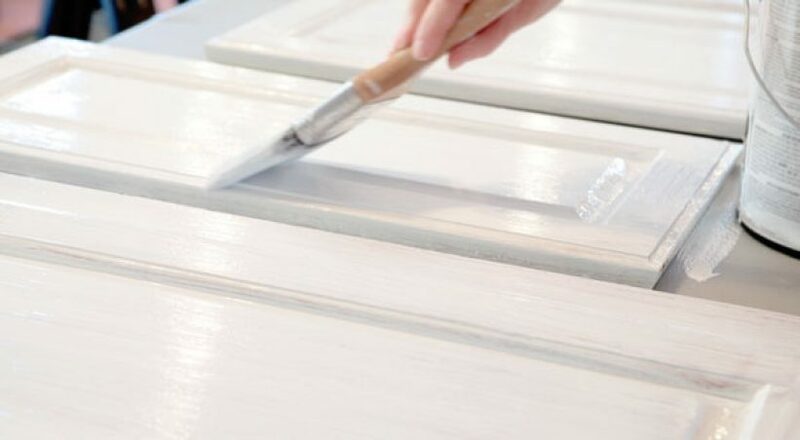 Coat the cabinets with a good-quality primer, and allow it to dry thoroughly. Two coats may be needed. When painting dark cabinets a lighter color, consider tinting the primer to the same color as the finish coat. Lightly sand the primed surface, making sure to remove any brushstrokes left during priming. Apply the paint using a foam roller for large surfaces and an angled brush for smaller, harder-to-reach areas. Don’t overwork the surface; a quality paint will level itself as you go. Consider using a high-performance waterborne alkyd that cures to a rock-hard furniture-quality finish. Ask your paint retailer for assistance in choosing the right one. Allow the paint to dry completely before applying a second coat. Once the paint has cured thoroughly, reattach the cabinet fronts and hardware. As always, check with your local paint store before you begin to ensure that you have all the necessary products and are thoroughly versed in each application step.